What are you listening to these days? Leave your music and podcast recommendations for me in the comments! This was my power song this fall! I listened to it on repeat in the shop and also while running a half-marathon last month (I attribute my sub-two-hour time to the combination of Zhu + caffeine). Favorite line: "She want it all / She want it all / She working hard for the money / She want it all." If you like this track, you might also like Automatic, As Crazy As It Is, and Zhu's sleeper hit from a couple years ago, Faded. I love this dark and brooding track. It's creepy and haunting, and also pretty catchy. I did a lot of welding to this music! Other Röyksopp tracks I'm enjoying: Skulls, Monument (Feat. Robyn), and Something In My Heart (feat. Jamie Irrepressible). One of my New Year's resolutions for 2016 is to consume less media produced by straight, white cismen. It's high time I make an effort to seek out women's voices, queer and trans voices, and voices of people of color. Listening to The Get has been a great way to kick off this project! The show is hosted by Ivy Onyeador and Rhiana Gunn-Wright, two whip-smart, kickass women of color from my class at Yale. They take on pop culture, current events, and meaty social justice issues in a conversational manner that's hilarious, riveting, snarky, and joyful. I didn't actually know them when we were in school, but, thanks to their podcast, I feel like we're practically best friends. More importantly, I'm a better-informed, more thoughtful feminist because of them. Check out The Get on iTunes! Here's an episode I found especially engaging: The Cost of Being A Bo$$. I've probably listened to this sultry song a hundred times this fall. I don't know anything about Marian Hill's story or background, but her music is addictive and fresh and melodic. If you like this track, check out Lovit, Got It, and Lips. If you listen to NPR, you're probably already familiar with this snappy economics podcast. They have so many good episodes, it was hard to just choose a few to highlight! There's the one about Super Business Girl, a feisty 12-year-old entrepreneur; there's the epic, multi-episode investigation of how t-shirts are produced in the global economy; and of course, there's the one where they scrutinize a monthly ISIS budget that was recently smuggled out of Syria. Catch more episodes on iTunes or on the NPR website. This is my shameless, pump-up, power anthem! Listen to this if you're feeling down about yourself and need a pep-talk. I didn't really fall in love with Clean Bandit until my best friend Jasmin took me to see them play live. They're so good! Global dance beats, strong vocals, and real instruments (which is refreshing if you mostly listen to electronic music, like I do). Don't miss Come Over (feat. Stylo G), Real Love, and of course, their Top 40 hit, Rather Be. In each short and sweet episode, host Hrishikesh Hirway deconstructs one song while interviewing the artist. Check out this episode, which is all about the Game of Thrones theme song! If you want more, find Song Exploder on SoundCloud, iTunes, and on their website. I'm pretty much always in the mood for Chet Faker. His music is melodic, soulful, and mellow. Side note: If you need a good Pandora station for a dinner party, you can't go wrong with Chet Faker! Don't miss Gold, Drop the Game, I'm Into You, and his stellar cover of No Diggity. This is not a joke. I love Akon. Not exactly a feminist hero, but you can't deny that he makes catchy music! Including a Bollywood song! In which he sings in Hindi! Did you know that?! I almost died when I first heard Chammak Challo. I also love Keep Up, Beautiful, and Right Now (Na Na Na). If you've made it this far down my list, then here's a little Easter egg for you. It's a silly little tribute to Akon that I made after welding, grinding, and sanding 26 Geo Bowls in one week. Cheers! Ever wonder what goes into each Elektra Steel piece? Here's a time-lapse video of me creating a Geo Planter from start to finish. You'll see me cutting out all 17 stainless steel parts with a power shear, drilling a hole for drainage, TIG welding the parts together, sandblasting the interior, sanding down the exterior welds with an angle grinder, buffing the outside with Scotch-Brite, cleaning it with alcohol, and finally sealing it with a clear metal oil. All in a day's work! 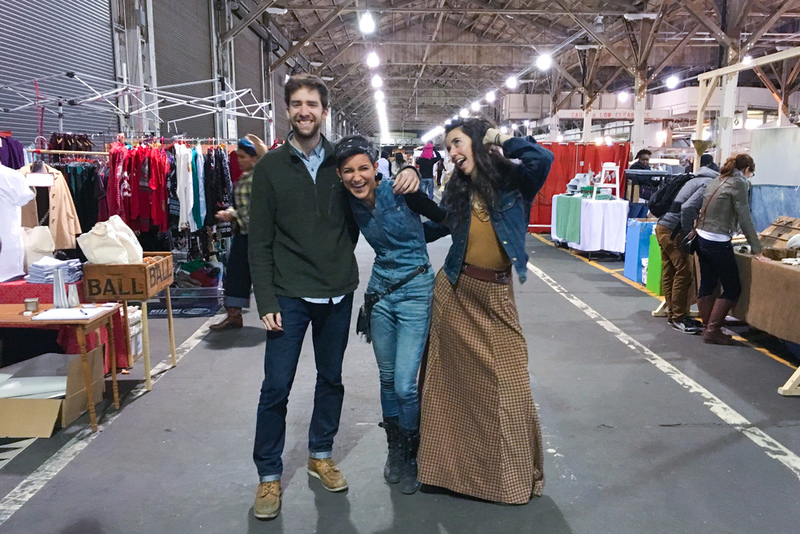 I had a booth at Urban Air Market's Holiday Show in the Dogpatch this past Sunday, and it was a BLAST! The weather that morning didn't bode well at all. 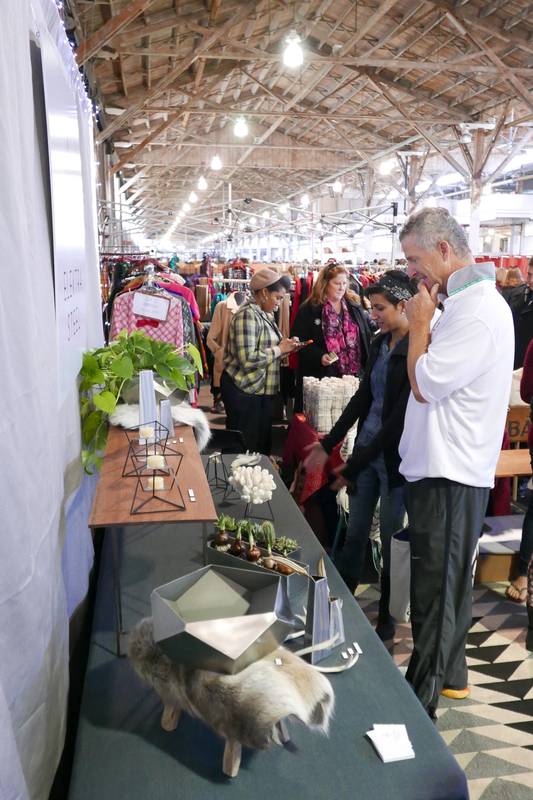 There was torrential rain during load-in, deep puddles that forced a number of vendors (including Jeff from Krakatoa Design) to relocate, and high winds that gusted through the giant roll-up doors and knocked over several booths. I honestly couldn't imagine that anyone was going to leave home in favor of a gusty, freezing warehouse. Boy, was I wrong! When the event opened at 11am, the rain died down, people trickled in slowly, and I mentally prepared myself to not make many sales. But then around lunchtime, it started picking up. And it didn't slow down until the event ended at 5pm. I definitely got the vibe that people had holiday shopping to do, and they were on a mission to get it done that day! A lot of my friends came out, including my parents, my partner Phil's dad, aunt, and grandparents, half a dozen members of my cycling team, two of my financial advisors, several family friends, and, of course, my best friend Jasmin. And just like last time, I ran into a few friends who didn't know I'd be selling there -- the look on their faces was priceless! I had a lot of great conversations with fair-goers about my process and my background. I especially enjoyed talking shop with the folks who had some welding experience. I can now spot them a mile away! They're the ones who immediately pick up a piece and start turning it over in their hands, trying to figure out how I'd made it. For this craft fair, I added an iPad to my display that played time-lapse videos on loop of me welding and sanding. It ended up being a useful tool: it drew a lot of passers-by into my booth, and I was able to better show the work that goes into each piece. When I got home at the end of the night and checked my sales numbers, I thought I'd accidentally pulled up the wrong date range -- the total was over double what I thought I'd made. Still incredulous, I checked to make sure I hadn't accidentally overcharged someone by, say, $1,000 (I hadn't, thank goodness). Once I was sure that it wasn't a mistake, I celebrated! 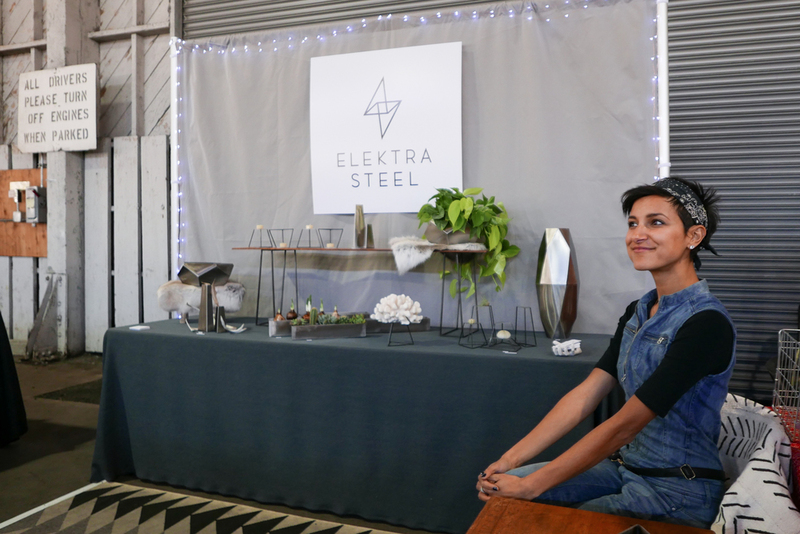 I still have a ways to go to make Elektra Steel a sustainable business that pays all my bills, but Sunday's show told me that I've got a good product-market fit, and I'm on the right track. Major thanks to Phil, who was a champ for helping me with load-in and load-out logistics, all of my friends and family who showed up to support me on a stormy day, and to my growing list of customers! I'm heading back into the shop now to finish up a few remaining holiday orders. Cheers! 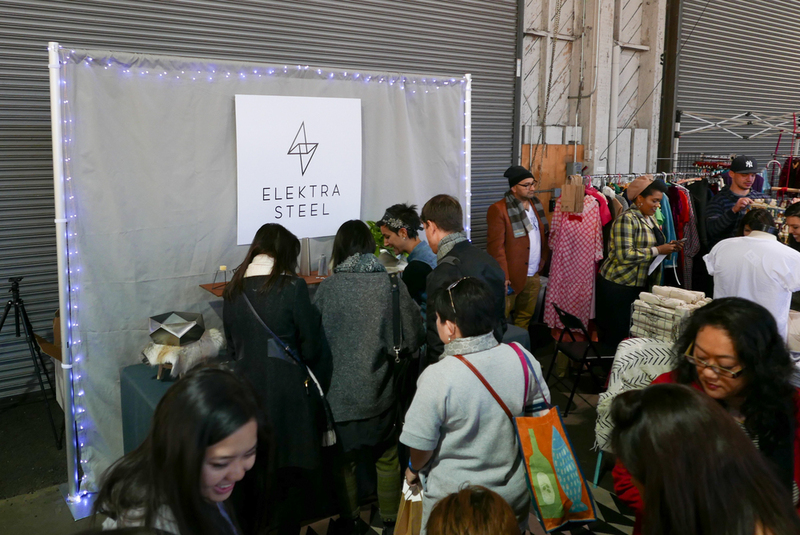 This past weekend, Elektra Steel made its retail debut at the SF Etsy Indie Holiday Emporium! The event was held at Pier 35, a massive warehouse right on the water next to Fisherman's Wharf in San Francisco. It was held over two days, Saturday and Sunday, and I believe over 50,000 people attended (crazy!). I'm thrilled with how it went! Realizing I can go into production beast-mode. I amassed an inventory of 85+ pieces in six weeks! Seeing friends! I had a bunch of friends and family members show up to support me, and that made my day. I felt like I was at my own birthday party! Also, I ran into a few friends who came to the show not knowing I'd be selling there. Those surprise reunions were so much fun! Getting ideas for new pieces. I had some unexpected hits (like the Prism Stands! ), and it gave me ideas for new directions to pursue with my work. Making money! I had no idea what to expect going into it, but I sold way more pieces than I'd expected, and I'm pleased with my sales. And most importantly, feeling like this business is a real thing. It was magical seeing my vision come together in real life. Below is a time-lapse video that shows how Jasmin, Phil, and I transformed a 10'x10' space in a warehouse into a welcoming little room in just over two hours. The three of us are a well-oiled machine: We've built two Burning Man theme camps together, and set up countless campsites. I couldn't have asked for a better build team! I definitely couldn't have gotten through the last few months without their constant emotional and logistical support. Not to mention that they kept me fed, hydrated, caffeinated, and sane throughout the show itself -- so grateful. On Sunday, my best friend from high school, Yennie, took a shift at the booth so that I could slam some food and use the restroom. Truly a team effort! A couple other thank-yous... Huge kudos to my studio-mate Jeff (the woodworker behind Krakatoa Design), who's a craft fair veteran -- I can't tell you how many times I bugged him with questions about the minutiae of booth set-up and logistics! And it was great having company during those long days at the shop. And lastly, a big thank you to my friends and family who braved the lines and the crowds to come support me, customers who paid me real money for things that I made, and everyone who's shown their support for me and my fledgling business over the last year. 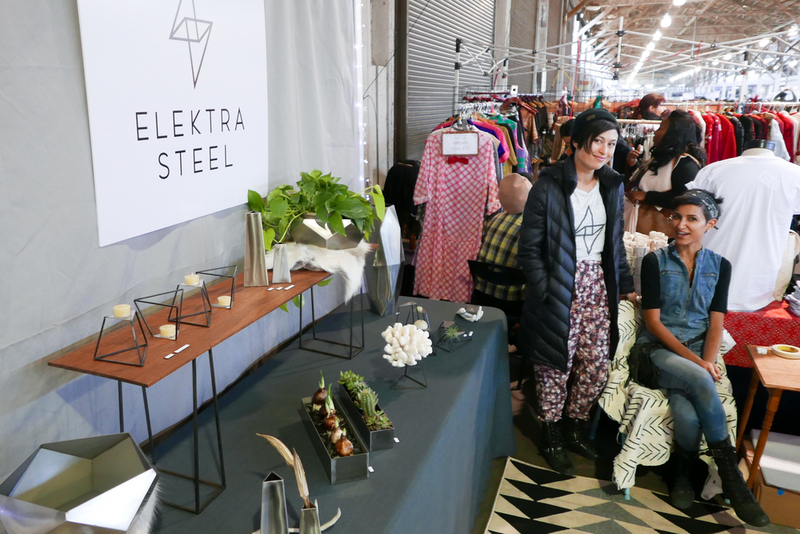 If you missed this craft fair, you have one more chance to shop Elektra Steel before the holidays! 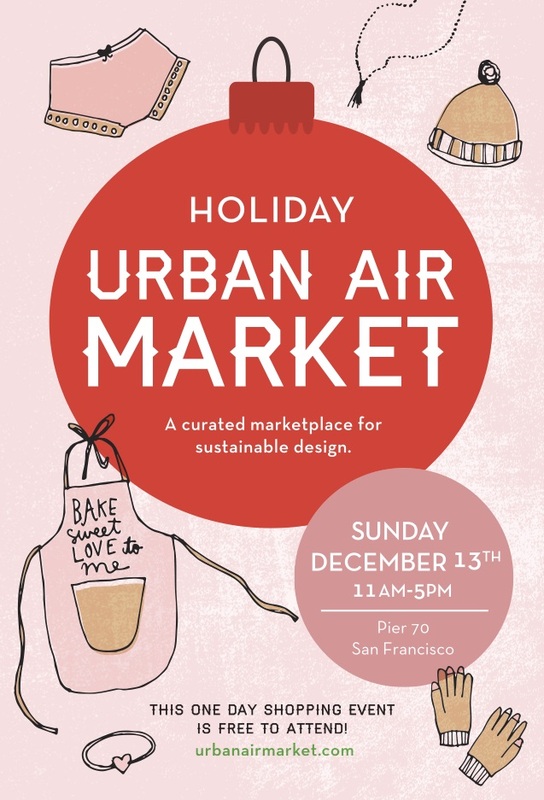 Come by the Urban Air Holiday Market next Sunday, December 13th -- it's at Pier 70 in the Dogpatch, from 11am-5pm. I'm excited to do it all again in just over a week! See you there! I’m selling at my very first craft fair is this weekend! I’ve been welding up a storm in preparation, and I currently have more than 80 pieces that are looking to find good homes. And most of them are in the $40-$90 range, which makes them perfect for holiday gifts! Come by the Etsy Indie Holiday Emporium this Saturday and Sunday at Pier 35 in SF and say hi! Well, it took me a year to get around to doing this, but I finally sent out the very first Elektra Steel newsletter! Take a peek below, and if you enjoy it, why not sign up to receive the next one in your inbox? 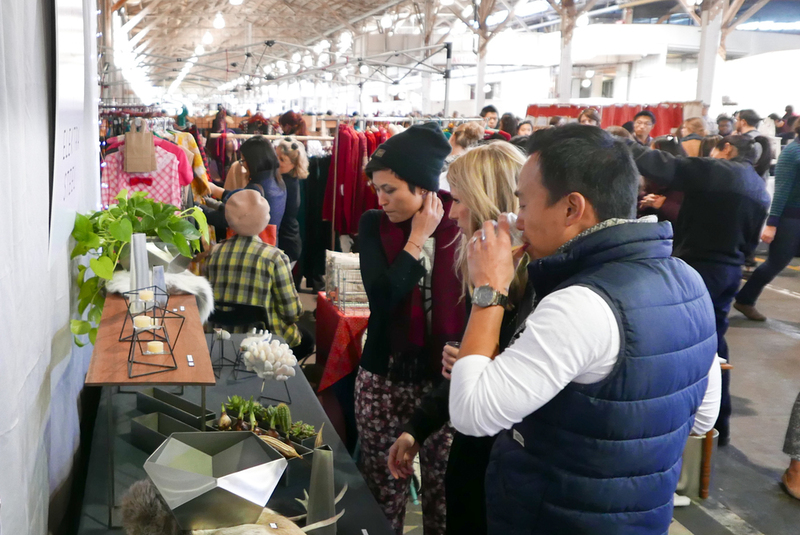 Mark Your Calendar: Holiday Craft Fairs! 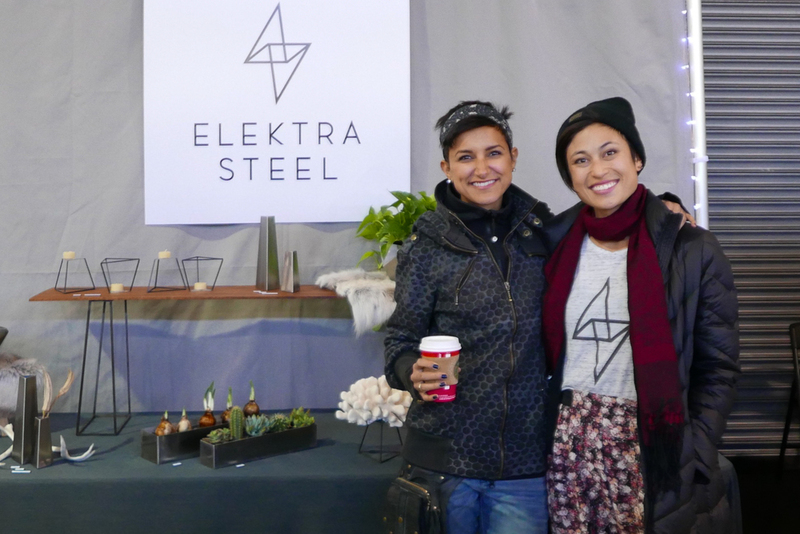 Add to Calendar 11/28/2015 11:00 AM 11/28/2015 5:00 PM America/Los_Angeles Elektra Steel at the SF Etsy Indie Holiday Emporium! 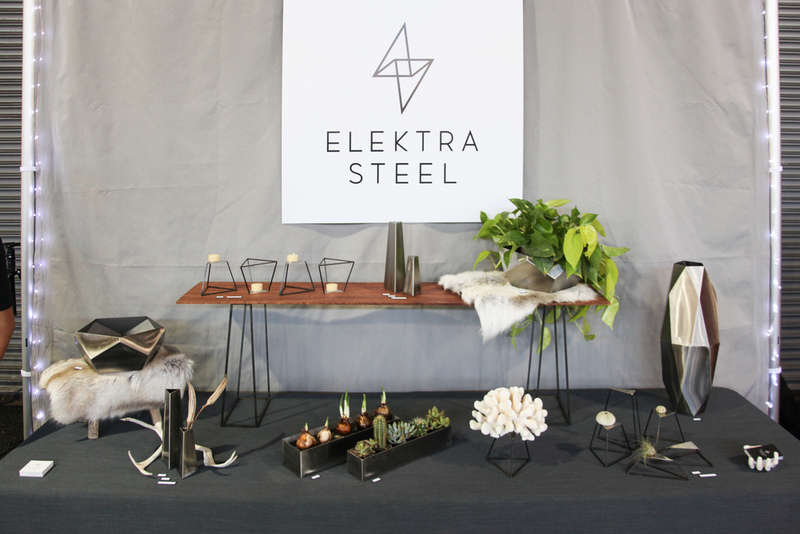 Elektra Steel will have a booth at the SF Etsy Indie Holiday Emporium! Swing by to get a head-start on your holiday shopping! I appreciate having the opportunity to understand the person and the story behind the object -- a refreshing change from online shopping. Last year at West Coast Craft, I bought a gorgeous horsehair necklace from fiber artist Faye Kendall. She and I talked for over half an hour about her process and her business! Now whenever I wear the necklace, it feels extra powerful because I know a bit of the story that surrounds the piece -- what inspired her, how she made it, and how much effort went into creating it. Anyway, I'm hard at work gearing up for my first two craft fairs: I'm designing my booth, ordering printed marketing materials, getting my Square card reader up and running, placing steel lasercutting orders, and -- most importantly -- blocking off five solid weeks for building up my inventory. I'm going to be doing a lot of welding these next few months! So, mark your calendars, wish me luck, and I hope to see you in person at one or both of these events! If you've seen me in person lately, you may have noticed that I'm a bit obsessed with my own logo: I have custom-branded headphones, t-shirts, tanks, jacket, stickers, and a phone case. When I first started thinking about developing a brand identity last winter, I knew I wanted a logo that was so compelling, that I'd want to put it on everything. Thanks to my talented designer (and childhood best friend!) Jen Wong, I can finally say: Mission accomplished! Jen and I have been friends since kindergarten. We took drawing classes together every Wednesday after school, stayed up late reading Wishbone books underneath blanket forts, did elaborate art projects during summer vacations, and spent much of fourth grade passing teeny, rolled-up notes to one another. After high school, she attended RISD, and then established herself as an incredibly talented design director at a digital agency in New York City. "After several weeks, we had three directions but realized — while they were close — they were not quite there." I had a gut feeling that I wasn't completely in love with the logo, but I felt bad asking Jen to go back to the drawing board -- especially after all the work she'd put into it already. When I finally brought it up, Jen was incredibly understanding and professional about my last-minute panic, and graciously agreed to rework the design. When she showed me a brand-new direction the very next week, my heart started pounding and I practically jumped out of my seat -- I knew it was the one. 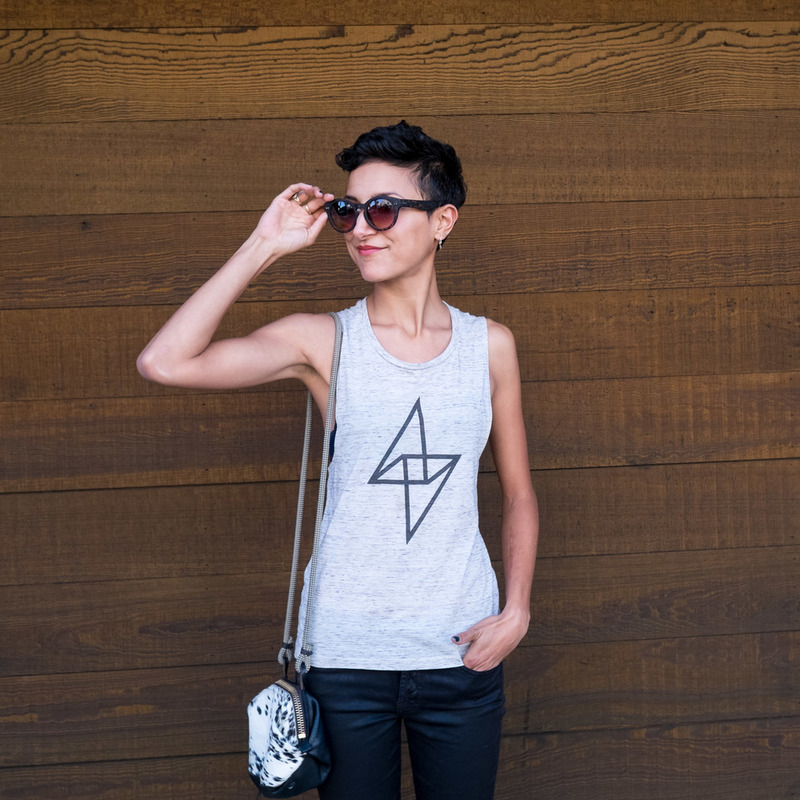 The mark she designed was bold and geometric, and felt simultaneously edgy and balanced to me. It was suggestive of a lightning bolt, reminiscent of the arc of electricity used in TIG welding. It immediately felt right. I was in love. The rest of the pieces fell into place quickly. "Once we had a mark we were happy with, I played with a few type options to match," says Jen. "Ultimately, I ended up modifying an existing typeface to better echo the sharp angles and points in the mark we created." After that, she whipped together a killer business card design, some Instagram templates, and a comprehensive set of brand guidelines that I refer to every time I'm creating a new asset or tweaking my website. 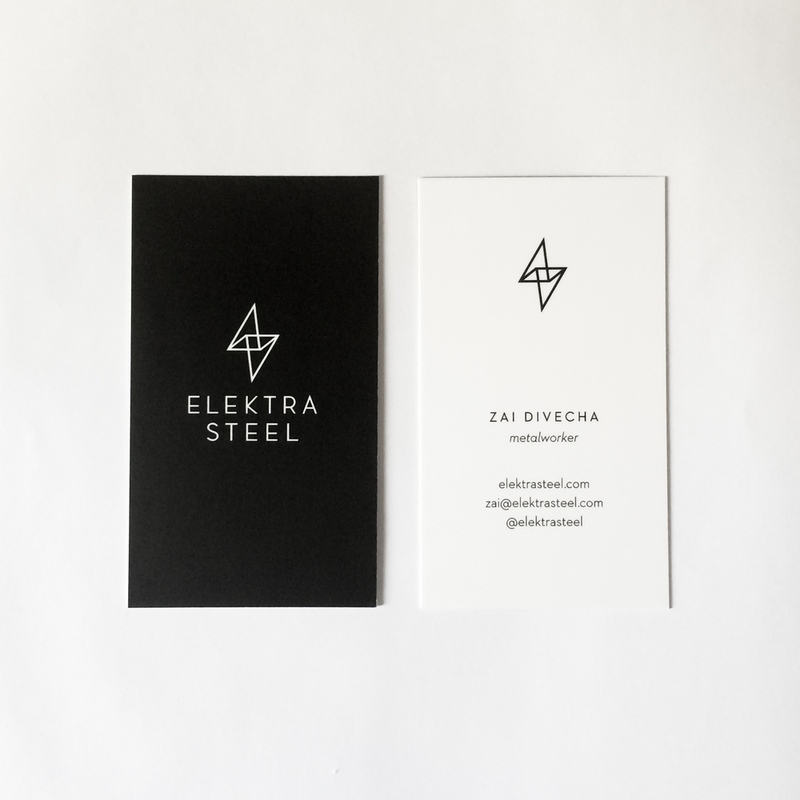 Having a sharp, consistent, and professional-looking brand across both digital and print has been a crucial step in building the Elektra Steel business. It tells a compelling story about what Elektra Steel stands for, and gives my fledgling company a polished edge. Huge kudos to Jen for her stellar work. And on a personal level, what a gift to have had this excuse to reconnect with my childhood best friend. If you dig the Elektra Steel logo and want to order your own gear, check out my swag store! 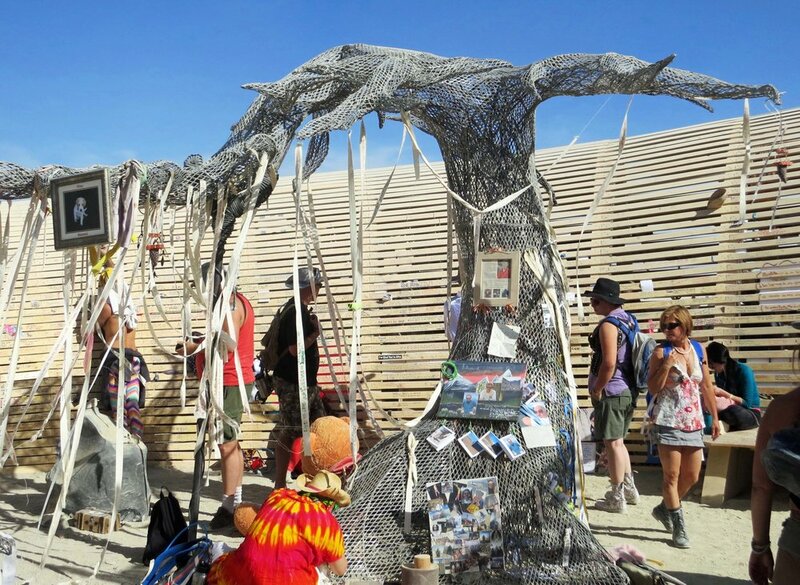 I recently started volunteering to help build a part of the Temple of Promise for Burning Man 2015. My friend Jazz Tigan is the artist who created this year’s winning design, and he's been bugging me for months to put my metalworking skills to use. I finally joined the volunteer team of builders, and I'm so glad I did! So far, it’s been an absolute blast. They’d already created the tree frames out of steel rod when I joined, and now we're cutting steel screen into slivers and wrapping it around the tree frames. I don’t have much experience working with organic, flowing curves, and I’ve learned a lot of new fabrication tricks already. One aspect that I've really enjoyed so far is the experience of being a worker bee on a large team of volunteers. I’m used to working solo on Elektra Steel stuff, and it’s really cool be able to tag-team construction challenges with a buddy or two. It’s also given me an opportunity to brush up on my MIG welding and plasma cutting skills, neither of which I’d used since high school. I forgot how many sparks there are with MIG! I foolishly welded without a jacket one day, and I'm pretty sure I singed off most of my arm hair. This is just a small peek into one portion of the Temple prep -- there's a whole other circus going on in Alameda, where a team of volunteers have spent the entire summer working on the Temple itself. They're loading up the trucks now and will be hitting the road soon! Follow Temple of Promise on Facebook for more updates. If you’re going to Burning Man this year and would like to contribute to the Temple of Promise, please consider donating to the Kickstarter campaign. 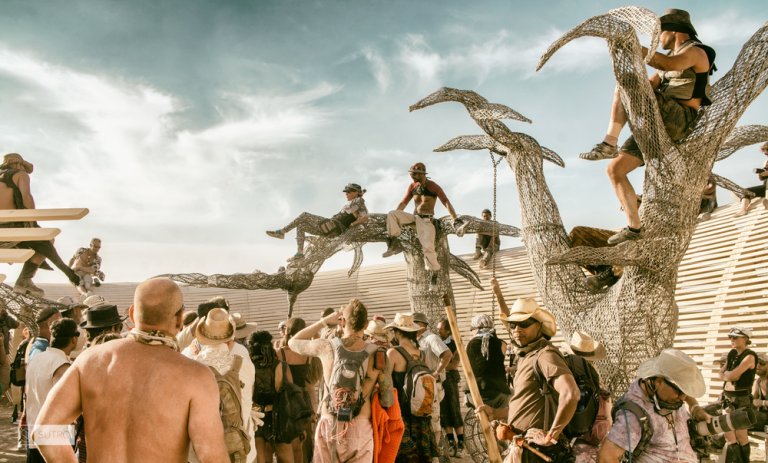 It’s going to be a stunning space in which to reflect, and its existence is due to the passion, money, and elbow grease of the Burning Man community. Thank you, and see you on the Playa! 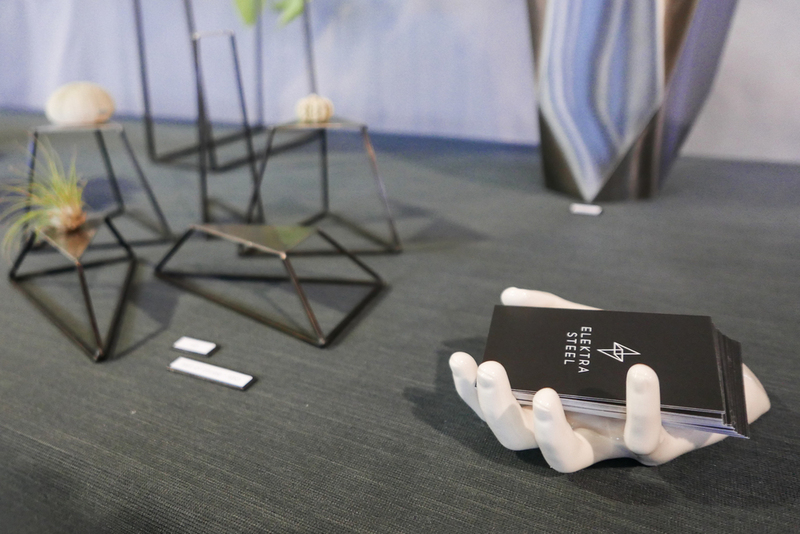 Last weekend, the Elektra Steel Geo Vase was featured in the American Craft Council Show in San Francisco! Bay Area architect and designer Gustave Carlson was asked by the American Craft Council to design a showroom in the exhibition titled, "Make Room: Modern Design Meets Craft." Each of the four rooms had a different theme -- earth, air, fire, and water -- and Gustave designed the air-themed room. He reached out to me to see if I would be interested in contributing a piece for it! I've admired Gustave's work for a long time now, so I was honored to be included. 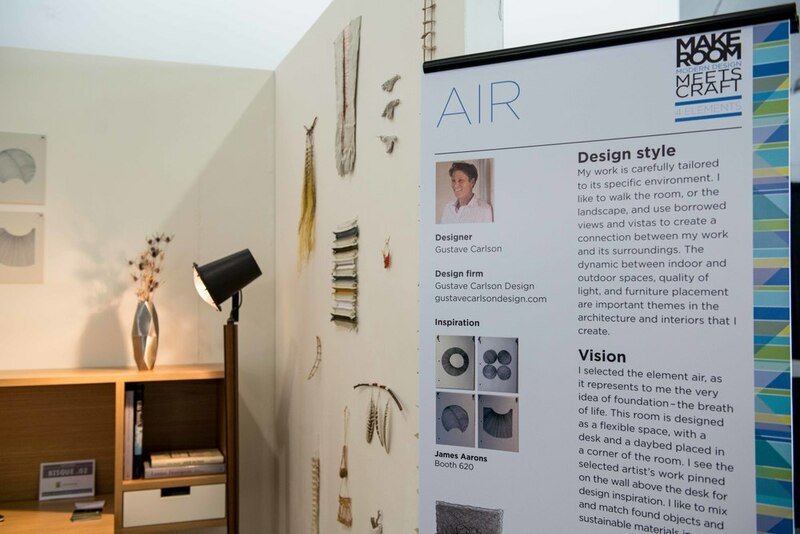 Check out more photos of Gustave's showroom at the American Craft Council Show below. And if you're curious about how I made the Geo Vase, don't miss the step-by-step Instructables article I published earlier this week. Special thanks to Reed Zelezny for taking these killer photos since I wasn't able to attend in person! 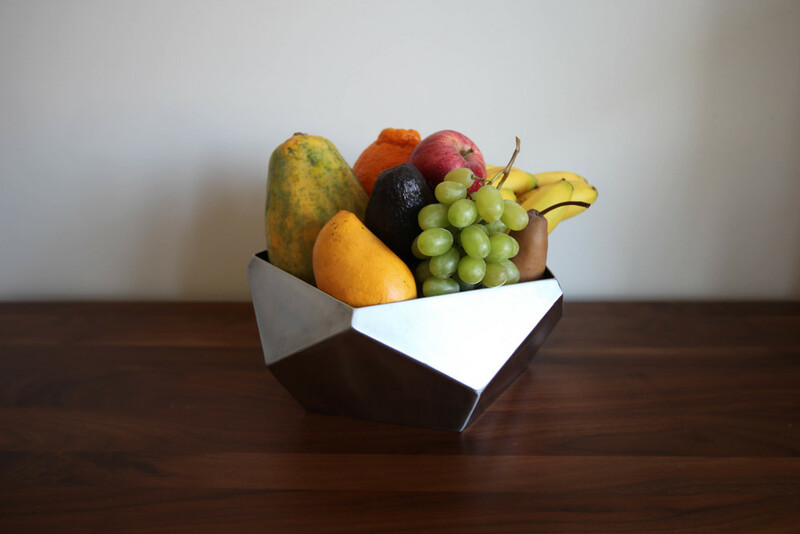 If you're curious about how I designed and fabricated this 31-sided stainless steel vase, check out the Instructables article I just published! In it, I share every step of the design and fabrication process with photos, time-lapse videos, and step-by-step instructions. Check out the Instructable here! For the last few weeks, I've been teaching TIG welding at the Crucible's Youth Summer Camps! I learned how to weld when I was 14, and it's so cool that I'm now in a position to teach other young people how to weld. Learning how to MIG, TIG, blacksmith, machine, and anodize when I was in high school had a profound impact on my teenage years. I was a quiet, studious high schooler who loved drawing and painting. But when I first stepped into the metal shop in ninth grade, I was intimidated -- I didn't see how I'd ever get comfortable with the scary-looking tools. But my shop teacher, David Clifford, taught me how to use every tool safely and confidently. And slowly, I began to see that I could use these powerful machines to create beautiful objects from my imagination. My confidence grew, and I fell in love with metalworking. Working on my high school senior project. Fast-forward thirteen years: David is still one of my dearest mentors (he actually served as a reference for me when I applied for the teaching job at the Crucible), and over the last couple weeks, I've taught nearly 30 young people aged 13-18 how to TIG weld. It's been an amazing experience! I'm starting to figure out what kinds of explanations and demos are most helpful, and I'm developing my own teaching style. I've been totally blown away by my students' creativity. So far, they've made miniature art cars, spaceships, elephants, coasters, robots, cars, bridges, pencil holders, stars, factories, hands, signs, and abstract cube structures. We don't give them that much to work with -- just some sheet metal, nuts and bolts, maybe a little leftover perforated sheet -- but they make magic out of it. It's also amazing to see their progression over the course of a week. On Monday, they're figuring out how to wield the TIG torch, which requires a lot of coordination and finesse. That's when they need the most instruction and feedback. 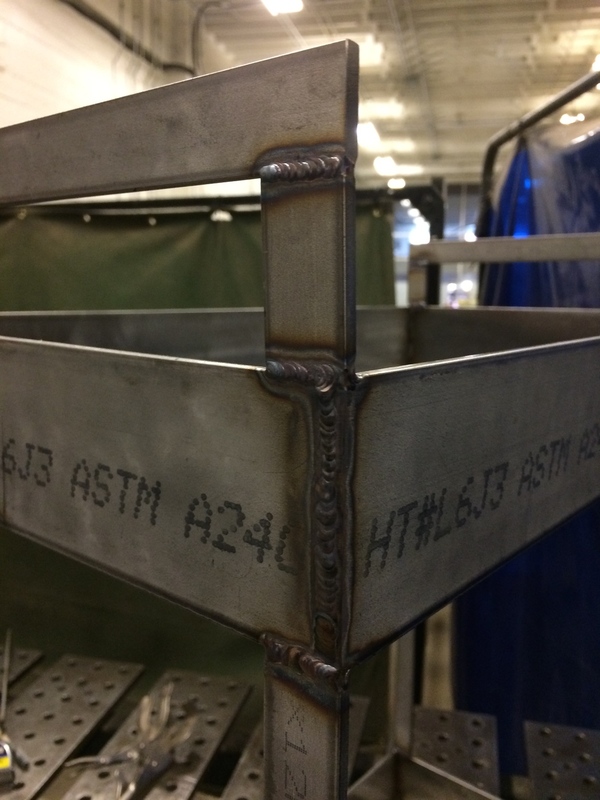 By Tuesday, they're successfully doing fusion welds, using filler rod, and assembling little cubes. 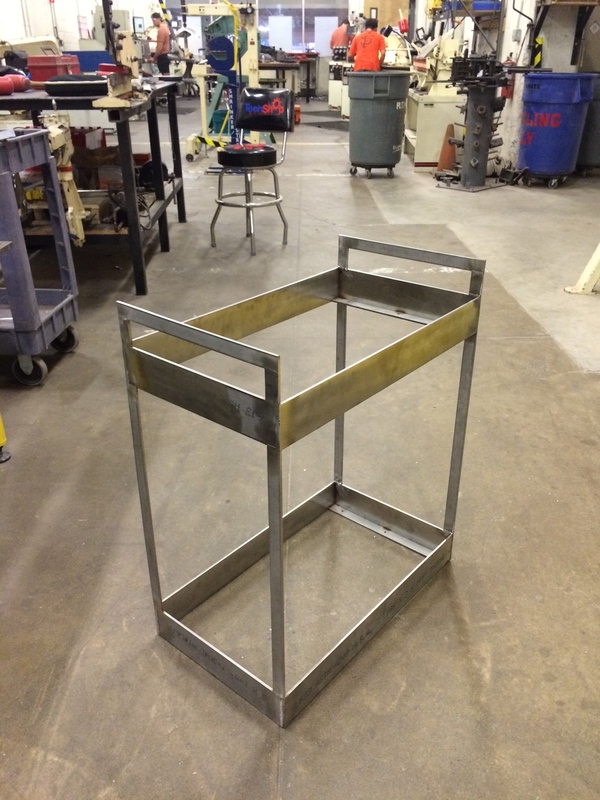 By Wednesday, nearly every student has a project in mind, and they're figuring out how to begin fabrication. On Thursday and Friday, I'm just a consultant, doing custom cuts here and there and helping problem-solve when needed. At the end of week, the Crucible hosts a gallery walk in which youth camp students across all departments (TIG, arc, blacksmithing, foundry, jewelry, glassblowing, kinetics, leather, etc.) showcase their work for each other and for parents. The students are always beaming, and I feel like a proud parent! None of this would be possible without Jazzy, my 19-year-old TA, and Kobe, my 17-year-old youth intern. This brother-and-sister duo started taking classes at the Crucible when they were only 12! They help me set up for class each morning, lead demos, mentor students one-on-one, and -- now that they've mastered the horizontal band saw, power shear, and angle grinder -- they're also assisting students with cutting and grinding during class. In return, I'm doing my best to help them add new tools and skills to their own metalworking repertoires. As I'm drafting this, Kobe and I are both working late in the TIG room -- I'm writing, and he's finishing up a gorgeous steel Godzilla sculpture for the Crucible's Fuego Internship showcase. I'm lucky to be teaching (and learning myself!) alongside these two stellar young metalworkers. If you live in the Bay Area, come check out the Crucible! They offer tons of amazing classes for both adults and young people. They also host team-building workshops for organizations, which are always a lot of fun (I've taught workshops for companies like Cisco and Zynga). Ask your boss if you can come to the Crucible for your next offsite! Ladies and gentlemen, I'd like to introduce to you the Claro Cart! This nifty rolling bar cart, made of stainless steel and shimmery Claro walnut, is a collaboration with my good friend and talented woodworker Caty Moniz! 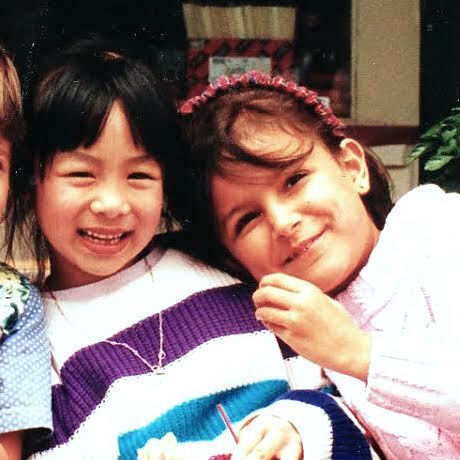 I first became friends with Caty because we worked together at Box headquarters in Los Altos. On our commute home one day about a year ago, we realized that we both loved making furniture. We had a good laugh when we discovered that she had finished wood slabs lying around her garage that didn't have table bases; meanwhile, I had a steel table base in my studio without a top. We joked about collaborating on a piece of furniture one day -- I'd do the metal, and she'd do the wood. And then a few months ago, we decided to go for it! 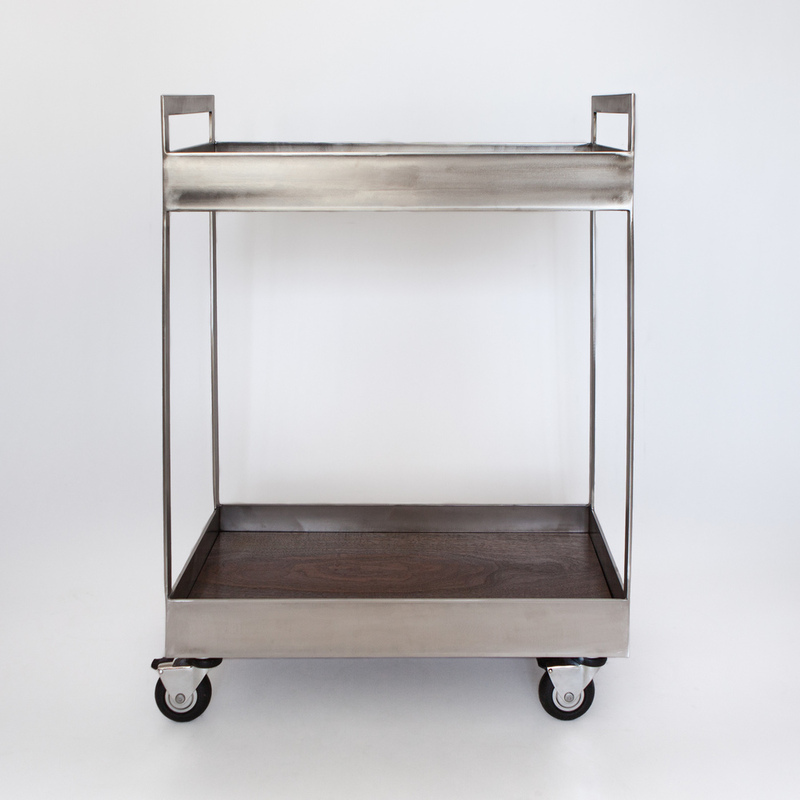 We came up with a simple, elegant design for a rolling bar cart that would show off the contrast of dark wood against bright stainless steel. 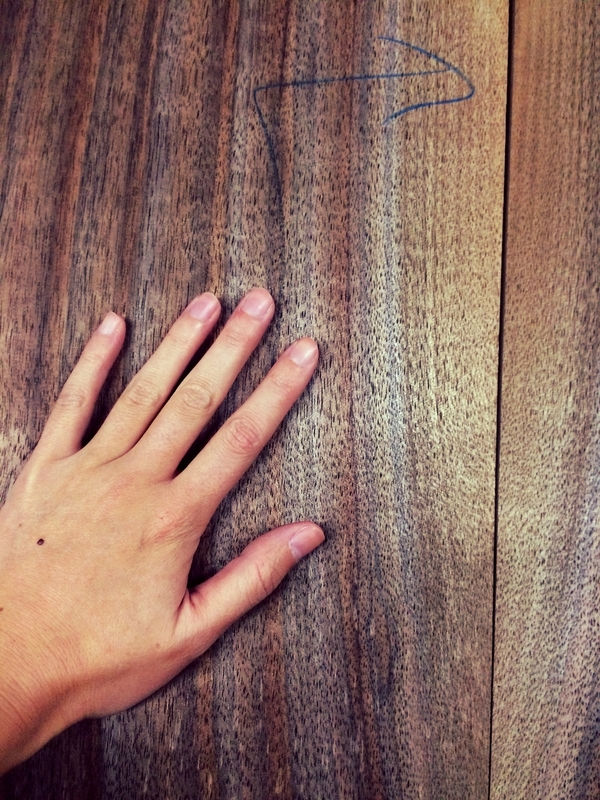 Caty hunted down a gorgeously marbled piece of solid Claro walnut while visiting family just outside of Jefferson, Oregon. Claro walnut is known for its striking figuring, often showing subtle intermixed colors of reds, browns, yellows, purples, and blacks in its grain. 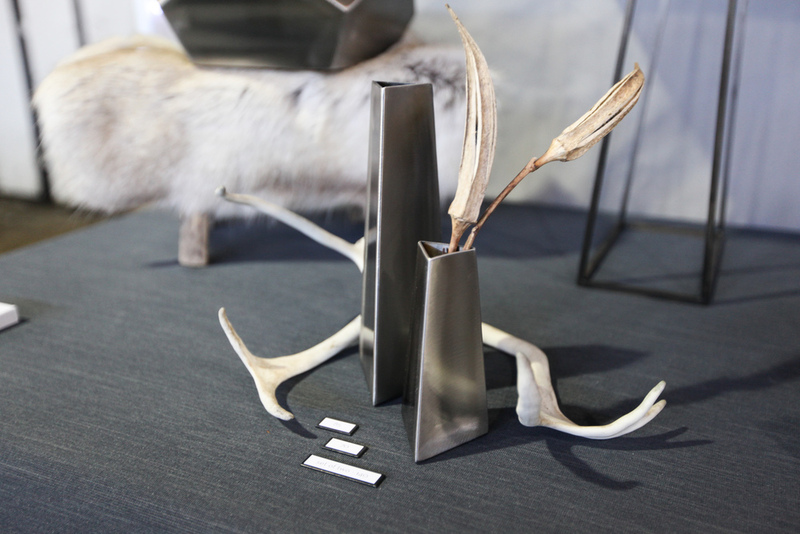 The piece chosen for the bar cart was no exception, with a lovely blond streak running through one of the pieces. 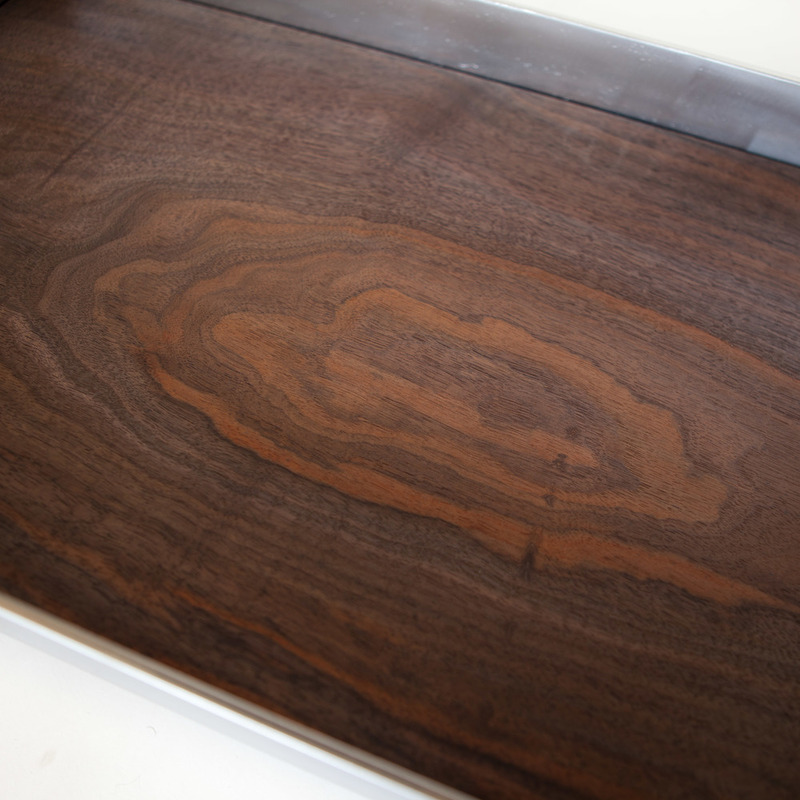 Caty cut and sanded the walnut, increasing the grit until achieving a silky finish. In order to bring out the natural colors in the figuring of the wood, she finished the pieces with a few coats of ProFin, an oil-based finish -- no staining for this beauty! Meanwhile, I picked up a some stainless steel flatbar from my favorite woman-owned steel supplier. I cut the bar down to smaller lengths, ground down the ends a bit to create channels for welding, and then TIG welded the frame together. I sanded the entire surface with an angle grinder to create a lightly-textured satin finish. Finally, I welded the locking stainless steel casters to the frame, careful to not melt the rubber wheels. After working on our respective pieces, Caty and I met up for dinner to join the metal and the wood. It was magical seeing it finally come together! Caty and I had so much fun making the Claro Cart together, and we hope you like it. It's available for purchase in the Elektra Steel shop for $1800. It will also be on display at The Crucible's Spring Open House this Saturday, April 11, 2015, from 12-5pm. Cheers! I just published my very first Instructable! I did a super detailed instructional write-up of how I made those geo bowls, complete with dozens of process photos and videos. Unlike the blog post I wrote a few weeks ago about the bowls, the Instructable is geared at my fellow metalworkers -- I nerd out about TIG filler rod thickness, how to weld without clamps or vice grips, and the advantages to waxing stainless steel. 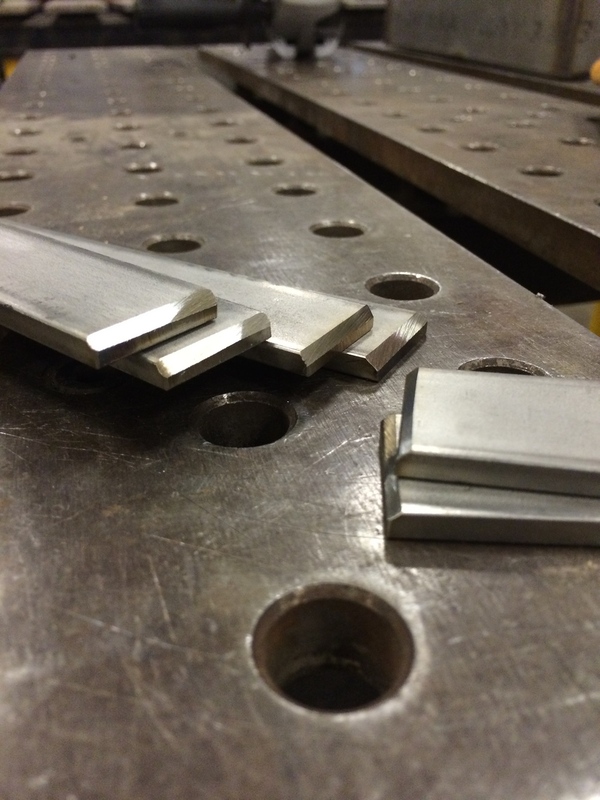 Are you a metalworker? Check out the Instructable -- I'm curious to hear your feedback, questions, and tips! I'm excited to announce my AIDS/LifeCycle Charity Raffle! I'm going to raffle off four handmade Elektra Steel pieces in order to raise $3,000 for the San Francisco AIDS Foundation by May 30th. Here's how it works: for every $20 that you donate toward the cause, you will earn one ticket in the raffle. The raffle will be capped at exactly 150 tickets. As soon as I've sold the last ticket, I'll draw four winners and ship the prizes! (And then I'll bike 545 miles from SF to LA, but more on that later.) Ready to get started? Donate now! What is AIDS/LifeCycle? It's a seven-day, 545-mile bike ride from SF to LA that raises money for the San Francisco AIDS Foundation and the Los Angeles LGBT Center, two organizations that provide critical services to people living with (and at risk for) HIV and AIDS. Those of you who know me outside of Elektra Steel know that this isn't my first rodeo -- this will actually be the fourth year in a row that I've participated in AIDS/LifeCycle. But it is the first year that I'm offering up handmade goods as an incentive for donating! 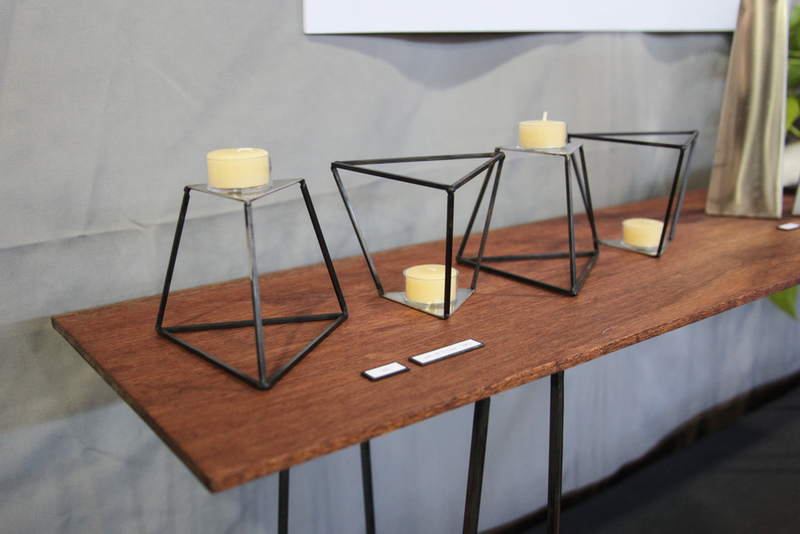 I will be raffling off one hex votive, one copper/steel cube, one bronze/steel cube, and one geo bowl. Prizes will be shipped anywhere in the world (my treat). Go to my AIDS/LifeCycle fundraising page and make a donation! Every $20 = 1 raffle ticket, so I'd recommend rounding up to the nearest $20. Winners will be selected and notified as soon as all 150 tickets have been sold (May 30th at the latest). Ready to donate? Do it! I participate in AIDS/LifeCycle every year for a number of reasons. I first got involved because the focus of my master's thesis research was HIV/AIDS, STIs, and sexual and reproductive health, and I wanted to find ways to support the cause outside of academia. I fell in love with AIDS/LifeCycle, and I kept coming back for more. Need some additional encouragement? Check out this link to see exactly how the San Francisco AIDS Foundation will use your money. Many thanks to my sister Mia for talking through the math with me in the middle of the night! I spent the last two weeks designing and fabricating 15 custom geometric bowls for a global tech company based in San Francisco. Their annual client and developer conference is coming up in a few days, and the bowls will be used as table centerpieces. 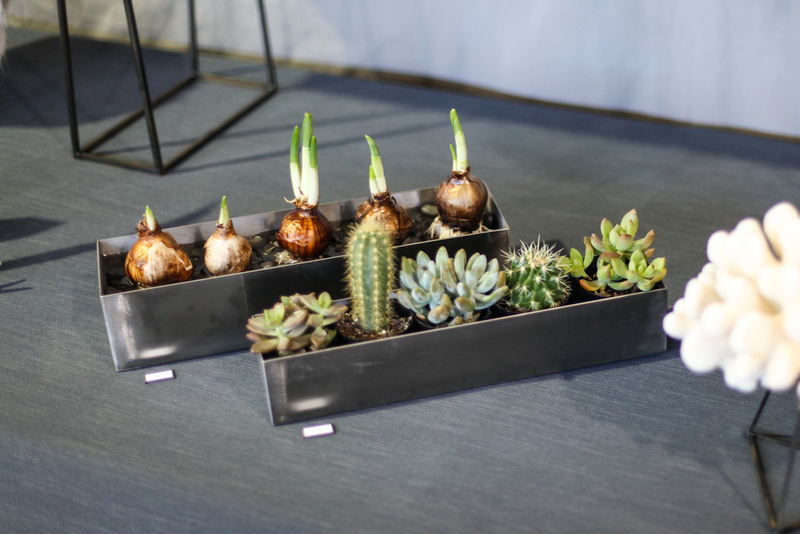 A friend on their events team had seen a photo of the geo planter I made a few months ago, and reached out to see if the design could be customized for their needs. I'd never done a production run this large before, but I was excited for the challenge. Here's how I made the bowls! 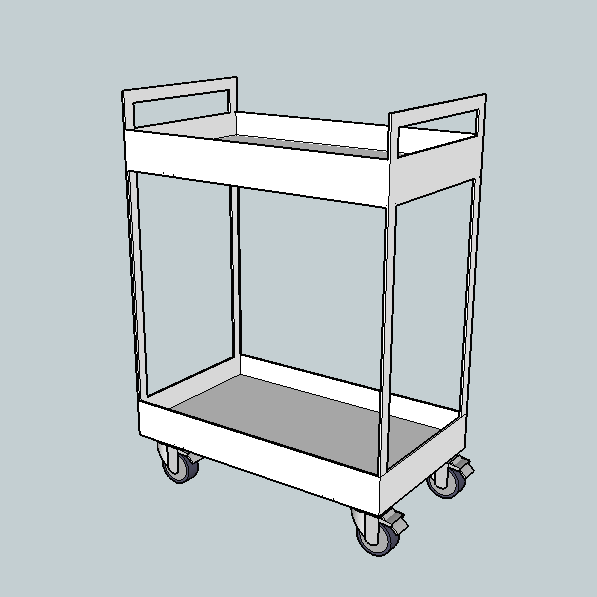 First, I created a 3D model of the design in SketchUp. I started with a dodecahedron (my favorite platonic solid) and modified it to create an open, faceted bowl. As soon as I got the thumbs-up from the client, it was time to waterjet cut the pieces. I used Adobe Illustrator to create a vector line drawing of all of the pieces that I'd need to cut out of stainless steel sheet. And then the welding marathon began! I started by tacking the faces together at each vertex. A number of metalworkers have asked me how I clamp down the pieces for this type of project. I actually don't use clamps or jigs at all. Instead, I just prop up the pieces on a block -- or even hold them together with my gloved hands -- and do a quick flash-tack to join the pieces. Then I bend the pieces into the correct angle before continuing to weld. Stainless steel is one of my favorite metals to work with because it welds cleanly and makes shimmery rainbows patterns. Here's what the bowl looked like after welding all the edges. For those of you who are really curious about this whole process, here's a four-minute time-lapse video of me tacking and welding a bowl. It was both luxurious and exhausting doing nothing but weld all day long. I welded all fifteen bowls in two and a half days, which is definitely some sort of personal record. What's interesting is how much I improved over the course of the project: When I made the initial prototype, the welding took me six hours (lots of trial and error!). Bowl number one took two and a half hours to weld (better, but still learning). By bowl number four, I'd gotten it down to 40 minutes (I'm a machine!!). I learned a lot about efficiency and scale with this project! Once the bowls were assembled, it was time for sanding and buffing. I like this step because it's like the big reveal -- I finally get to see the sharp jumble of sheet metal transformed into the lovely and smooth piece I'd envisioned in my mind. For sanding and buffing, a variable-speed angle grinder is my best friend. I started with an 80-grit flapwheel disc to sand down the welds, and then went over the entire outer surface with a Scotch-Brite disc to give it a satiny sheen. Here's a time-lapse video of me sanding and buffing a bowl. It shortens 45 minutes of elbow grease into a snappy 35 seconds. Not gonna lie, I was physically exhausted after sanding all 15 bowls. The weight, vibrations, and centrifugal force of the angle grinder did a number on my forearms and hands. My neck ached from bending over, and I was covered in a fine layer of metal dust at the end of each day. It was a relief to finally move on from this stage! For the last step, I gave each bowl a coat of clear metal wax, which hardens and cures after being buffed. A protective sealant isn't really necessary for stainless steel, as it won't rust or tarnish, but I like the way wax looks. It gives the piece a little extra sheen, and it keeps fingerprints from appearing on the surface. Here's a close-up of the bottom of a bowl, on which I'd stamped my company name, letter by letter. I had recently gotten coffee with Meyghan Hill from Whorehaus Studios (she's a kickass LA-based designer, welder, and business woman), and when chatting about this project, she insisted that I mark each piece with my company name -- brilliant. I immediately ordered metal alphabet stamps for myself. Thank you for the tip, Meyghan! And here's a photo of the bowl at the conference! I took a time-lapse video of me sanding down one of the stainless steel bowls I welded earlier this week. First I used a variable-speed angle grinder with an 80-grit flapwheel disc to sand down the welds. Then used a Scotch-Brite disc to buff the entire outside of the bowl to a lovely, satin finish. This speedy, 35-second video captures 45 minutes of elbow grease! This week, I'm making 15 stainless steel centerpiece bowls for a tech company's annual conference. This is the largest production run I've done so far. It took me two and a half hours to weld the first bowl together, but by bowl number six, I'd gotten it down to 40 minutes. Here's a four-minute time-lapse video I made of me welding one bowl at 12x speed. I'm excited to announce that my dodecahedron floor lamp is now available for purchase at Paxton Gate, both online and at their retail location in San Francisco's Mission District. The dodecahedron floor lamp, nestled amongst feathers, eggs, terrariums, and other curiosities at Paxton Gate in San Francisco. If you've ever strolled down Valencia Street, I'm sure you've noticed their striking window displays. 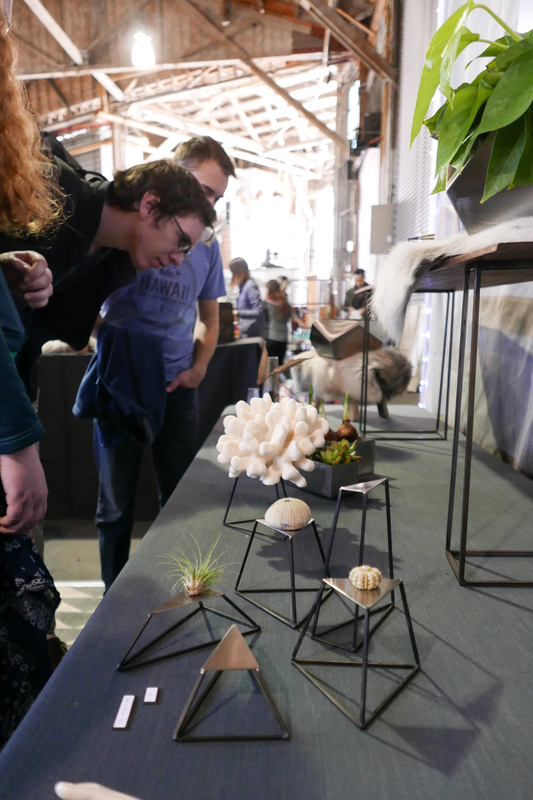 They specialize in taxidermy, skeletons, rare insects, exotic plants, and succulents: "treasures and oddities inspired by the garden and natural sciences," in their words. Totally up my alley. Another shot of the lamp. Paxton Gate has actually been one of my favorite stores since I was in ninth grade -- I would occasionally stop to explore their charming and macabre curiosities on my way home from high school. So, you can imagine how excited I am to have them as my very first stockist! I recently got introduced to Paxton Gate by my friends Vinit and Spencer at The Pricerie. 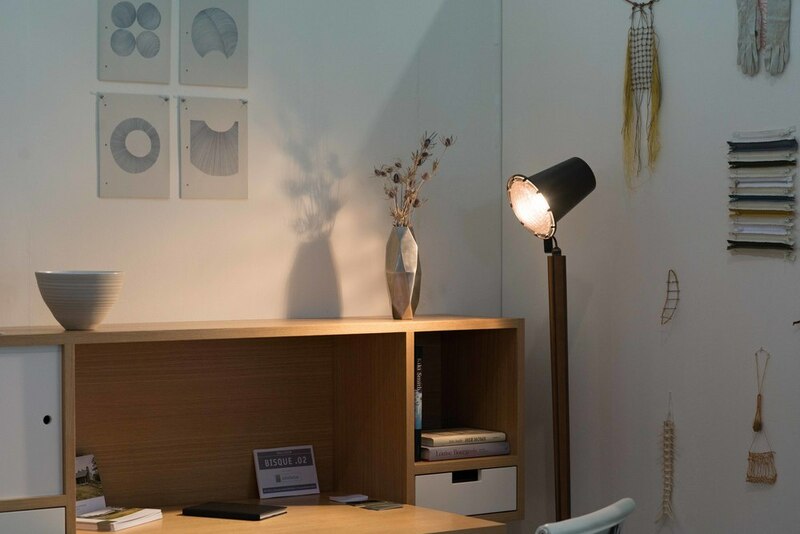 The Pricerie's mission is to connect makers with appraisers in order to help them price their work. This is a much-needed service, in my opinion: every artist and maker I've talked to has struggled with pricing. Anyway, I submitted my geo planter to be priced, and one of the five expert appraisers they matched me with was Michael Levy, Creative & Operations Director at Paxton Gate. He saw some of my other work, asked Vinit and Spencer for an intro, and the rest is history. Next time you're exploring the Mission, swing by Paxton Gate and take a look in person! Not local? Click here to see product details, dimensions, and additional photos.